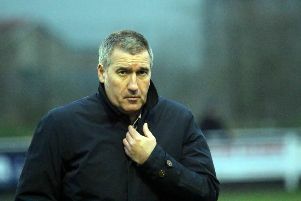 Banbury United boss Mike Ford has his sights set on a top six finish despite his side having a lot of ground to make up. Like most Evo-Stik Southern League teams, the Puritans had a blank weekend instead of completing two more premier division fixtures in three days. Saturday’s trip to Frome Town was postponed followed by Monday’s derby with Stratford Town. The Stratford game should still draw a decent midweek crowd but the long trip to Frome is one the club could have done without. United will face two matches each week until the end of the season but Ford does not want to use that as an excuse. Following last night’s (Wednesday) Oxon Senior Cup tie with Kidlington, United resume Evo-Stik Southern League action on Saturday when Biggleswade Town visit the Banbury Plant Hire Community Stadium. And Ford will be looking for the three points to keep his side in with a chance of making that top six spot. He said: “The top five look to be out of sight so I want us to finish sixth. Some teams will be thinking their season is already over but not us. United remain unbeaten in eight outings and Ford was quick to pay tribute to those players who had filled-in during a spate of injuries a the club. On the injury front, George Nash will not be back until Tuesday’s trip to Royston Town, who currently occupy sixth spot, at the earliest and Ford will need him back as Jack Self is unavailable for that game. The enforced rest may have benefitted players with niggles including Jack Harding but Ford said it is between games that his keeper needs time to recover and he is not going to get that over the next few weeks.